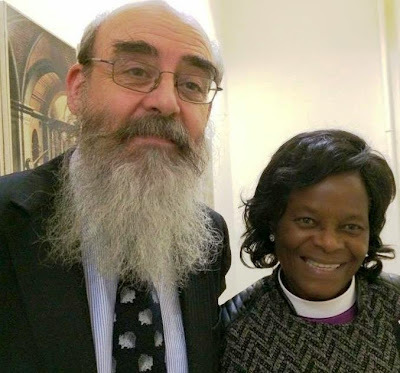 The first woman bishop in Africa, the Bishop of Swaziland, the Right Revd Ellinah Wamukoya, was in Dublin this week. This was the same week that saw the first woman bishop consecrated in the Church of England. But Bishop Ellinah was in Dublin for the consecration of the Right Revd Kenneth Kearon as the new Bishop of Limerick and Kilaloe in Christ Church Cathedral, Dublin, last Saturday. Many sections of the English media reported from York Minster on the consecration of the Right Revd Libby Lane as Bishop of Stockport as though she were the first woman bishop anywhere. If they had looked a little further, they would have seen first woman bishop in the Church of Ireland, Bishop Pat Storey of Meath and Kildare, among the consecrating bishops. Bishop Pat was one of the three principal consecrators of Bishop Kenneth on Saturday afternoon. But Bishop Ellinah was there too as a consecrating bishop. Since then, Bishop Ellinah has preached in Rathfarnham Parish in Dublin, and in Saint Macartin’s Cathedral, Enniskillen, visited Kilkenny College, and met the bishops of the Church of Ireland. She was back in Dublin on Wednesday, when she took part in the Community Eucharist in the Church of Ireland Theological Institute. This has been her second visit to Dublin, and this morning [30 January 2015] she met the directors of the boards of Us Ireland and Us Ireland, formerly the United Society for the Propagation of the Gospel (USPG) before our board meetings in CITI. She gave us first-hand accounts of the problems and opportunities facing Anglicans in the Diocese of Swaziland before she headed off to Canterbury for an intensive course designed for new bishops in the Anglican Communion. The Anglican Church in Swaziland works to respond to the huge difficulties faced by the country. However, the Church there has few resources and currently relies on overseas donations to run its programmes which include local care points and feeding stations for the many child-headed households. Africa’s first Anglican woman bishop was in Ireland for the first time in 2013 to join the celebrations marking the rebranding of USPG as the United Society (Us), when she preached at a special Eucharist in Saint Michan’s Church, Dublin, on 29 May 2013. Bishop Ellinah is a former mayor of Swaziland’s economic capital, Manzini, and has worked as town planner. She was consecrated in November 2012, and her first visit to Ireland was her first official trip overseas.